I’m going to ask Primary Technology to consider rolling this out across all of their sites! 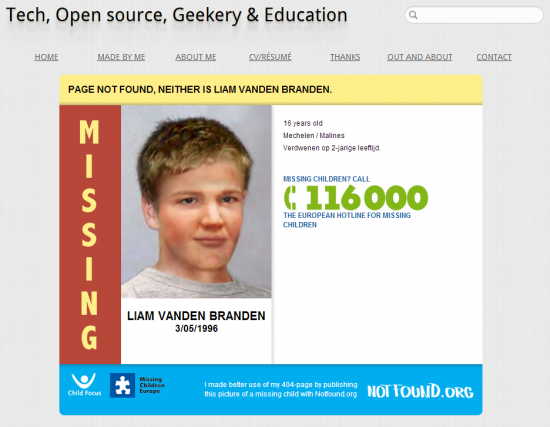 What do you think, would you be happy if your schools blog 404 pages helped to find missing children? We all know what a children’s illustration looks like right? 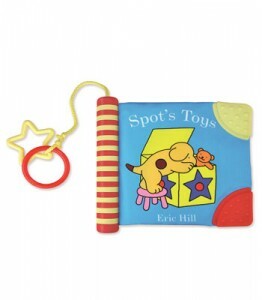 Sort of in-between Dr Seuss and the Gruffalo, maybe with a bit of Spot thrown in. What I want to know is why in all of the test groups I have done over the last few weeks the most vector/cartoon style stuff is more popular with kids (both boys and girls) from the ages of 8 to the ages of 12? 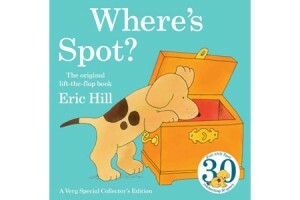 Spot is a good example of an illustrator moving their illustrations towards what we have found is a “preferred style of art” amongst Primary School age children. The objects have become simplified and the “stroke” effect has been used with a greater thickness. I can only assume that cartoon channels such as Nickelodeon & The Cartoon network have changed the style of art that the children I spoke to enjoyed. I know this is all very speculative and I am making some big assumptions but the evidence I have found whilst trying to find the correct illustrator for Safe Search has shown me that kids prefer vector based art as opposed to hand drawn objects..
How does this even matter? Well it means that in the future we will try to keep our art more vector based, we will hire graphic designers/artists instead of illustrators. There is a place for illustration and I’m sure if they are done right they can look great however I can be confident in saying that Primary Technology will be sticking to the style we have used in the past as it seems to be a winning formula(despite the fact I tried to break it). Please don’t take this post as factual, it is not scientific. It is my opinion based on my experiences of a small(handful) of children in only a few schools. Posted in ICT, primary, Primary School, Primary School ICT, Primary School Safe Search, review, safe, Safe Search, safety No Comments on What style of illustrations do Primary School kids like? Safer Practice with Technology – http://www.kenttrustweb.org.uk/UserFiles/CW/File/Advisory_Service_ICT/E-Safety/SaferPracticeWithTechnology-260509.pdf – For adults working in schools, this document covers using technology as a communication tool in professional relationships, protecting adults from minteration of behvaiour and understanding personal and professional boundaries. North Yorkshire County Council – E-safety Links and Resources – http://content.yudu.com/Library/A1dk37/esafetyApril09/resources/index.htm?referrerUrl=http://www.yudu.com/item/details/74728/e-safety–April-09-%3Frefid%3D18007 – This site is a selection of recommended sites to use to delivery E-Safety in schools. Internet Safety @ Next Generation Learning – http://www.nextgenerationlearning.org.uk/At-Home/Internet-safety/ – Here you will find links to lots of resources on internet safety. The content is aimed at both home and school and has resources for parents and children. E-safety week – http://www.esafetyweek.info/ – I love this idea. E-Safety can affect every aspect of our lives so to introduce it across an entire week seems fantastic. This site is made by Oldham and provides a framework for other LA’s to do similar exercises. Primary School Safe Search – http://primaryschoolict.com/ – A google powered safe search engine that gets educational results more accurately. Great for setting as pupils and teachers home page. I like this site because it’s not so much a teaching resource as a learning aid.